The Bubble Blower Machine is possibly one of the coolest things we've seen in the office for some time. This is mainly down to the fact that everyone, from the very young to the very old, will be mesmerised as it pumps out thousands of bubbles. It's also fairly simple to use. Just remove the base and fill the tray inside with bubble liquid (or washing-up liquid and water. 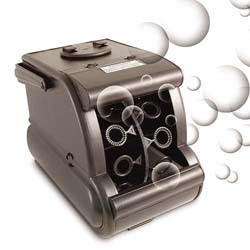 Then, turn the machine on, and an internal fan blows as the bubble hoops rotate - sending thousands of bubbles blowing into the air. The machine is made of plastic and measures 22x17x12.5cm (LxHxW). It also needs 8 x C batteries to operate (or a mains adapter - sold separately).In can be used inside for parties, as well as outside for garden parties, or to keep the kids amused for an afternoon. Sadly, the model that we reviewed seemed not to work as well as advertised. To start with the bubbles produced were fairly small and, secondly, of the two rotating groups of bubble hoops, only one seemed to produce any bubbles. Not only that but it had a nasty habit of frothing up the mixture and then spilling out of the front of the machine. Also be careful where you plan to use this, as the bubbles that hit the floor tend to make a hard surface very slippery. However, we have been told by two other people we know that his is not the case with the models they own (the same as we reviewed) so we may just have received a faulty machine. While the novelty will soon wear off, it is an ideal addition to any party.